NeDi unfolds its full potential with CDP, FDP and/or LLDP capable devices in the core of your network. It can also include other network components, but it works best, when those are located at the network perimeter. NeDi needs SNMP read access for all network hardware. Privileged CLI access can be used to get the MAC address table on IOS based switches (faster than vlan indexing and supports port security) or access points (leveraging SNR as ifmetric), but in general SNMP would be sufficient. The configurations are read via CLI as well and stored in the DB or as text files. The building or street address can persist of several sub-buildings with a 2nd separator (e.g. _). The height’s only necessary, if the device comes in different sizes (e.g. a VMware ESX server). The MAC address is used as primary key for the nodes. If you use consistent and properly terminated vlans, you can combine them with the MACs to form a new primary key, which allows the same MAC to occur in different vlans. Device Access defines credentials and methods how devices should be contacted. Discovery allows to map IPs and ports or set borders where it should stop. Messaging & Monitoring take care of polling and notification settings. Nodes Related settings how nodes should be read from devices and treated afterwards. GUI Settings control menu and appearance. PoE load during a VoIP migration. Yes, those are several hundred IP phones! rrdstep defines the discovery interval. Make sure it always matches your crontab schedule. Most importantly are the graphs created with this value. This means if you change this interval, you’d need to delete all RRDs and have NeDi recreate them! In order to find a good value, you’ll need some testing. Depending on the device types, discovery settings and the connection, around 20 devices per minute can be discovered (this is just a ballpark figure!). You can create multiple discovery tasks, if you separate and start them manually for now, but this should be automated at a later stage. For a simple setup and a network with around 500 devices an hourly discovery and a resulting rrdstep of 3600 is recommended. login credentials for devices should be set correctly, if you want to use CLI access with nedi (e.g. to backup configs). If the login fails, the cliport of the device is set to 1, preventing further login attempts. This can be reset via Devices-Status. Use System-Files to edit nedi.conf and the seedlist to define starting points (otherwise NeDi will use the default gw). A run without any options will result in a plain static discovery using the Seedlist or the default gateway, if you haven’t added any seeds there yet. Seedlists let you add single IPs or ranges like 10.10.1,2,3.5-100. Those ranges are expanded to single hosts. If you precede an entry with ! they’ll be removed from the seedlist (e.g. !10.10.1,2,3.11). You can specify the seedfile to be used with -u and the config with -U, with that you can run discoveries on different parts of your network in parallel for example. -v Prints heaps of information such as mac address tables, ARP-tables, interface tables or read configurations. -db Will also print out error messages and create *.db (-dv) files to store its state after the discovery. Using -dc also logs CLI access to input.log and output.log. Open 2 more terminals and tail -f to them in order to debug CLI problems. -D on the other hand should only be used on it’s own. It will not discover your network, but rather use the previously generated *.db files to restore its state. Functions to be debugged can be uncommented at the beginning of the script (This option is intended for developers only). 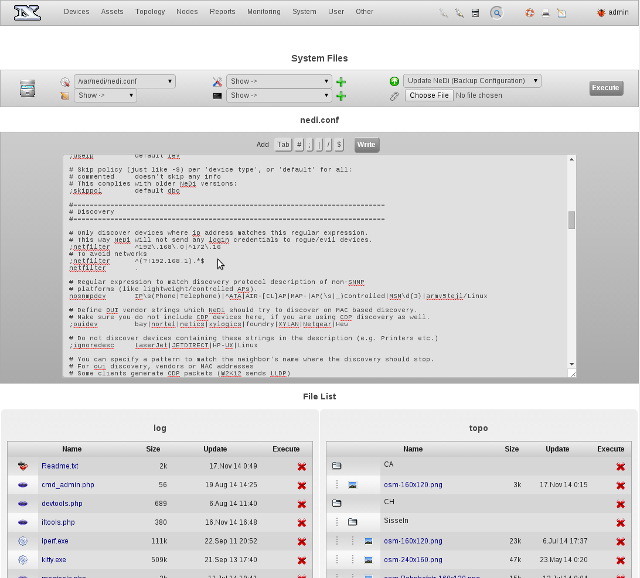 Now use System-Files or edit the crontab file directly to schedule discovery tasks. 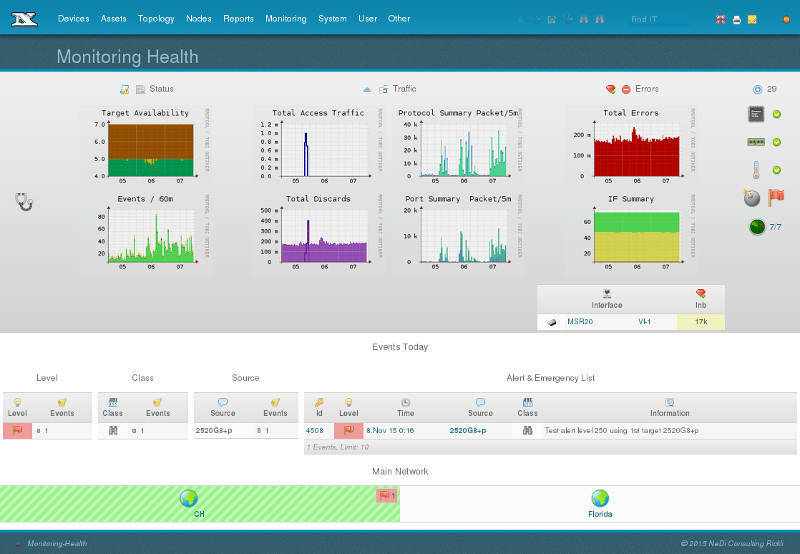 You’re ready to start managing your network with NeDi with the GUI.